The images that we associate with conflict zones are usually grim ones that are inextricably linked with those of war, suffering and poverty. For an outsider it may be hard to imagine that from within those places, so occupied with survival, art may emerge. A West Bank tour that includes visits of cities such as Ramallah, Bethlehem and Jenin will however reveal those places as the home of a thriving Palestinian art scene that features museums, galleries and theatres. Similarly, a closer look at Gaza will show us that artists can and are drawing inspiration from their home and are engaging in creative activities, that may even display notions of hope for a better future. The Gaza Strip, with a total area of 360 square kilometres and a population of approximately 1,6 million people, constitutes one of the most densely populated regions of the world. Gaza City, with an estimated population of 450,000 is the largest city in the whole of the Palestinian territories. With Israel and Egypt controlling the movement of people and goods in and out of the region, as well as due to the continuity of Israeli air strikes frequently targeting essential infrastructure, Gazan life is unpredictable and often chaotic. 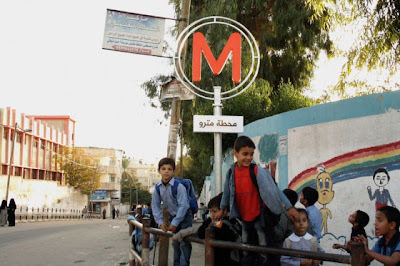 In order to establish some sort of routine within this chaos, Gazan artist Mohamed Abusal started envisioning a network of seven metro lines running across the Strip. The Palestinian artist is quoted as having been daydreaming about the idea ever since his return from a visit to France and observing the every day traffic chaos in his home town. The idea was also partly inspired by the existing underground tunnel system, used to smuggle both weapons and essential goods to the Strip: "We’re experienced in digging holes and tunnels underground so we must put that experience to good use now," the artist said in an interview published on the regional website Mashallah News. Looking at the map of the imaginary Gazan metro network, it becomes clear that Abusal put a lot of thought into the conceptualisation, including present and future needs of the population. Line 1, or the Green Line for instance stretches across the whole of Gaza, connecting the Erez crossing into Israel to the Rafah crossing into Egypt. Line 7, or the Pink Line, envisions a rebuilding of Gaza airport which would in turn also need means to transport passengers to and from there. 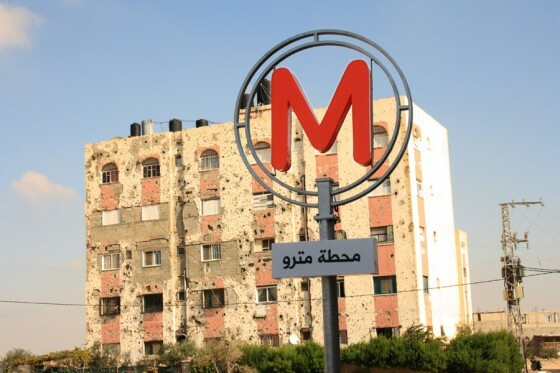 The metro would be accessible for each and everyone and would run on sustainable energy supplied by Egypt so as to make it immune to the frequent power cuts due to Israeli air strikes, as well as to the blockade. Abusal's project constitutes an example of Palestinian art that directly engages with the context from which it emerges, that emphasises the difficulties of life under occupation, and using it as a point of departure to look at the possibilities that emerge from it and at the same time envisioning a more positive future. Abusal's work is now being exhibited in Gaza City and according to Mashallah News, will be touring Palestine in the coming months.